Fulfill is a utility provided with the Timestone Software Internet Ordering System (IOS). With Fulfill a user may view and print orders received through IOS. Other functions may also be performed with Fulfill such as exporting a text file of order information and the printing of headers. Once launched Fulfill connects both to the Web Server (in the 'cloud') and to the local MySQL Server (Timestone database). Approximately every 60 seconds it monitors the web server for new orders and downloads them into the Timestone database whereupon they are displayed in Fulfill. This process occurs automatically. Downloading of new orders can also be triggered with the Refresh button at any time. Fulfill is not licensed and may be installed on as many computers as desired. Upon launching Fulfill the user is presented with the MySQL Connect window. Connection details for both the local MySQL Server (Timestone Database) and the cloud Web Server are enterted. 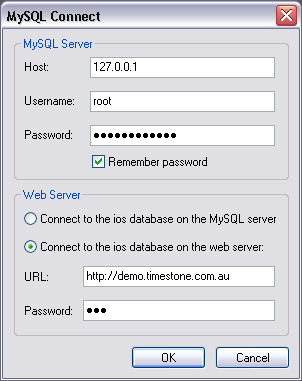 Enter either the name or ip address of the MySQL Server along with the username and password. Note these are usually the same credentials as used to connect the Timestone applications such as NeoPack/Professional or tsAdministrator. Select the option to 'Connect to the ios database on the web server'. Enter the URL for your IOS installation. This is the usually same URL used by your customers to use IOS. Enter the password given to you at installation. Fulfill incorporates two 'Modes'.The Template Designer or Design Mode is only used to create headers for use in Fulfill - item strips which are printed for each new product and order headers which are printed at the change of an order. The main mode of Fulfill is the Orders Mode where orders are viewed and printed. The diagram below shows the main Fulfill window with brief explanations of the various sections. Figure 2: The main window in Fulfill - Orders Mode.